In 2009, the JAPCC built upon its hard-earned reputation as NATO’s pre-eminent advocate for the development and enhancement of Joint Air and Space Power today and into the future. The year started in fine fashion with our reaccreditation by HQ Allied Command Transformation – we were the first Centre of Excellence to undergo this process and, subsequently, received a glowing report. We continue to maintain a close relationship with both HQ Allied Command Transformation and our Sponsoring Nations, providing them with timely and relevant advice and products. We are proud of our achievements this year, which you will see summarised ­within this report. I would like to highlight especially our work in encouraging NATO to move forward in respect of Space. The JAPCC Assessment on NATO Space Operations set the scene, but it was through numerous speaking opportunities and the vigilance of our staff that the message on the criticality of Space to contemporary NATO operations was well and truly transmitted. The year was also characterised by our increasing engagement with HQ Allied Command Operations in delivering effects focusing firmly on current operations. This served to ensure that our strategic perspective on Air and Space Power transformation is fully informed by the complexities of real-world operations, and demonstrated the JAPCC’s ability to ­provide relevant, timely support to the contemporary war-fighter. The work undertaken this year on the Air and Space Power contribution to Countering the IED threat in Afghanistan thus represents a sig­nificant additional, symbiotic, line of ­development for the JAPCC, as well as presenting us with a number of practical challenges to overcome. Similarly, the 2009 Force Protection review of the Kabul International Airport Ground Defence Area, ­delivered by the JAPCC, provided ­planners and incoming Force Elements with the best and most recent advice with which to prepare, equip, train and deploy relevant capabilities. It is no coincidence, therefore, that our 2010 Conference takes as its ­theme the Role and Challenges for NATO Air and Space Power in Contemporary Operations. As you will see, there are many other key products that the staff from our 17 Nations have produced. I encourage you to read the summary and, should you have any questions, to either visit our website or call us to discuss them. I am pleased to report that our staff numbers have remained stable this year, with our manning maintained at around 87%. Our key leadership positions are filled. We anticipate a new Director within the first quarter of 2010 as General Mark Welsh III takes over from General Brady. I am thankful for all the advice and contribution from General Brady to endorse and promote the work of the JAPCC. We have reviewed the balance of our Subject Matter Experts and are making adjustments in order to ensure that we continue to attract the right people with the necessary knowledge and experience. During 2009, Italy filled the vacant Future Space position, the United States filled the vacant Maritime Air, Carrier Ops post, and the Netherlands covered the vacant Information Operations position. While a degree of ebb and flow in our manning is an inevitable ­consequence of national requirements, it is clear that our Sponsoring Nations ­continue to provide highly competent personnel to fill a wide variety of positions, and for that I am most grateful. Our Annual Air and Space Power Conference continues to grow, both in attendance and impact. This year, we were at maximum capacity and hosted over 240 participants from across NATO and many other nations. Furthermore, we published two editions of the JAPCC Journal and will continue the successful distribution of this product in order to share our ideas, and those of our contributors, as widely as possible. I want to especially thank our commercial partners, who have not only contributed to our publications, but have also provided sponsorship to allow us to produce and distribute these documents. 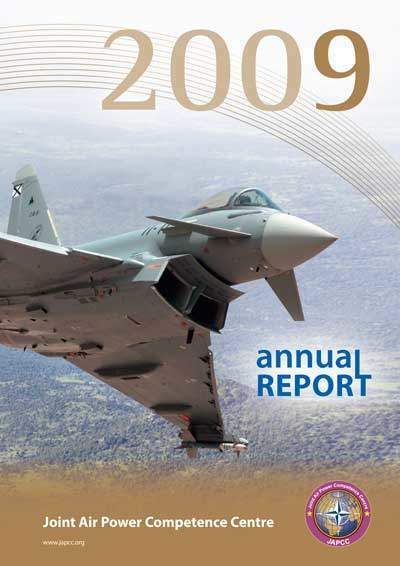 We look back on 2009 as another successful year in supporting NATO and our Nations. We now look forward to 2010 determined to continue to work on innovative ideas for the transformation of NATO Joint Air and Space Power.